Cheap and easy, these savory herb dumplings are gluten-free, egg-free, dairy-free, and free of all other common allergens. 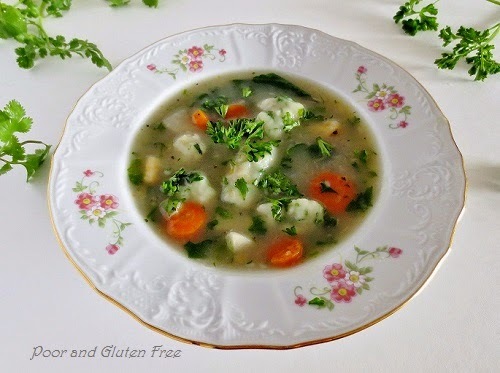 This root vegetable soup with easy gluten free dumplings is so simple and quick I've made it twice this week now, with variations on the herbs. They were husband approved both times. And the best thing is that it's filling, so it makes for a very simple, healthy meal in itself. Also, if you happen to be partaking in Lent, no matter what your restrictions these dumplings and soup should be safe since they're free of meat, eggs, dairy, butter, etc. So so simple. It takes about 5 minutes to chop the veggies. 5 minutes to prep the dumplings, and a total of about 25 minutes cooking (some of which is done while the dumplings are being prepared). To keep this super cheap: I use flours (white rice flour, tapioca starch, and sweet rice / glutinous rice flour) that I get at the Asian market. For the Erawan Brand of Glutinous Rice Flour it usually costs $1-2 for a bag in the store, and the same goes for the Tapioca Starch and the White Rice Flour. These soup keeps really well in the fridge for 2-3 days, and in fact the flavour of the broth improves as it thickens and the flavours blend, so feel free to make extra or even make it a day ahead of time! 2. For the dumplings: Sift together dry ingredients. Beat in milk / soda water, cider vinegar, oil, and herbs. Beat until smooth. Once vegetables in the soup are softened, turn heat up to medium-high and drop the dumpling batter into the soup one tablespoon at a time. Cook 5 - 7 minutes until dumplings are all floating and fluffy. 3. Add remaining herbs, salt, pepper, greens, and parsley to the soup. Cook 5 more minutes to blend. Adjust salt and pepper to taste. Let sit 10 minutes to cool. 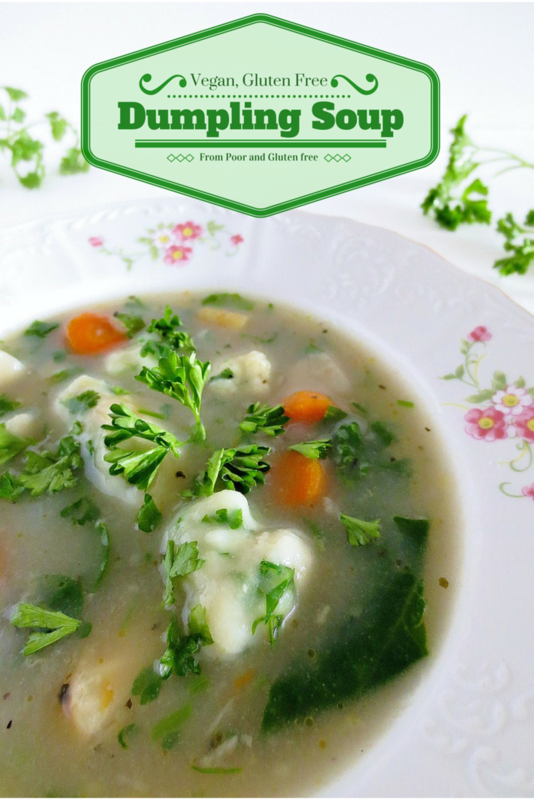 As I said, this soup is even better reheated the next day, so you can always make extra, or make it a day ahead! Did you know that beer makes gluten-free baked goods rise better? Check out my latest cookbook and bake up some delicious, boozy breads! that looks & sounds delicious, thank you!